Looking For Holiday Business Class Fare Deals To Europe On Lufthansa? Me Too……. Thought about heading to Europe during the wonderful Christmas season to experience the Holiday Markets? Counting on traditionally low Business Class fares from anywhere in the USA to most of Europe during November/December? Hoping to spend $2500-$3000? For some reason, Lufthansa (at least for now) has not offered their typical attractive fare deals to lure Americans to Europe for the Holidays. For years, I’ve been able to book tickets in Business Class for travel this time of year for as low as $2400 to perhaps as much as $2800. This year, there’s nothing even close to this price point except for a couple of rare combinations. One being Houston – Budapest and the other being NYC to Frankfurt. Otherwise you’re going to be paying $5000-$9000 to fly in Business to Europe to drink your spiced wine. Hell, for $4100, I flew from Chicago to Johannesburg and back a few weeks ago with SWISS in Business. In fact, I was looking to book a couple of seats for my wife and I for Thanksgiving Weekend, and the best LH Biz fare I see is $8400 for Chicago – Vienna. LOT Polish only wants $4000. Looks like an easy decision for which carrier to chose. But even the ‘LO’ fare is nuts for this time of year! On LH, JFK – Munich is $6000 and Washington – Frankfurt is criminal at $9400!!! At this point, they’re charging First Class prices for Business Class seats. Oh, and there’s this from LH.com when looking at Houston – Budapest. Those of you familiar with LH gateways within the USA will get a kick out of this…..do you see what’s wrong with this picture? 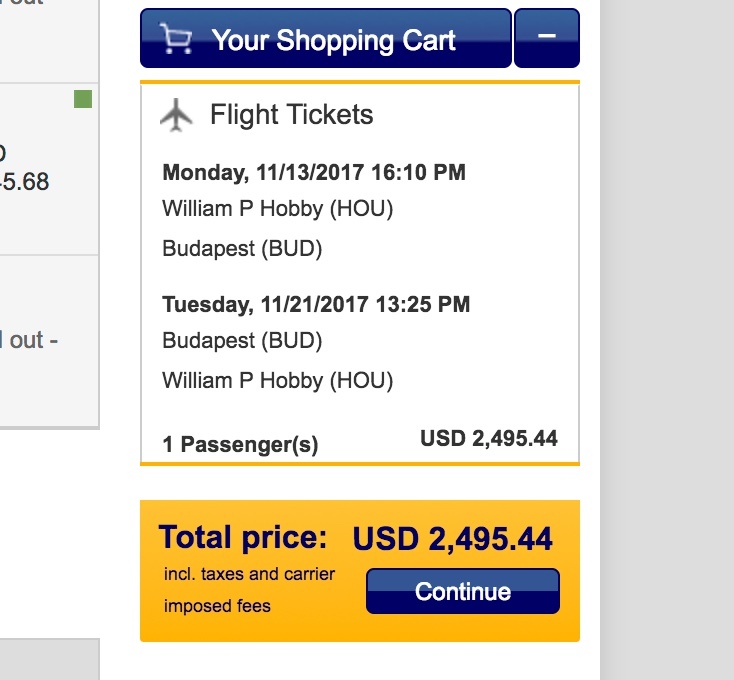 Houston to Budapest from $2500, great fare..Only problem is that Lufthansa doesn’t fly from this Houston airport, but their reservation system thinks they do! 🙂 I suspect that you still need to should up at ‘IAH’ to board your flight. I suspect that with Air Berlin’s demise, LH feels less pressure to compete on price for travel to Europe even though AB hardly had a US presence. Despite Lufthansa saying that pricing would continue to be competitive even with the lack of competition, it’s obvious that they’re not living up to that commitment and are already passing the impact of AB’s collapse to passengers. In fact, I’m seeing some Premium Economy fares reaching $2000 from the midwest and east coast which would have been only a few dollars less than Business Fares in previous years. If any of this changes, I’ll follow up with the info, but with November only days away, we may be out of luck as far as seeing any decent pricing to get from the States to Europe this Holiday Season. LUFTHANSA GROUP Expanding Widebody Capacity to Berlin For Certain October Dates…. Due to the demise of Air Berlin, and the fact that many Air Berlin loyalists are ‘stranded’ without their favorite carrier, LH Group has announced that it will continue to send widebody aircraft to Berlin in order to accommodate travelers wishing to travel to and from Berlin. This announcement follows on the heels of Lufthansa’s use of the 744 during certain flights between Frankfurt and Berlin during September. Lufthansa in their press release feigned surprise at the fact that they’re seeing increased demand from Berlin, but with AB’s shutdown looming what was to be expected? With LH being able to buy a significant chunk of AB’s operations, aircraft, and staff this obviously did not really come as a surprise to anyone. From October 23 to October 25 SWISS, Austrian, and Lufthansa will schedule most, if not all flights to be operated by A321 aircraft in order to increase capacity from Berlin to Frankfurt, Munich, Zurich, and Vienna. During this 2 day period, Lufthansa flights not being operated by the A321 will see the A346 operate the flight between October 23 and 25. For it’s part, SWISS will send their A333s to fly between Zurich and Berlin on October 24 and 25. Austrian will run their 767s between Vienna and Berlin on October 24. LUFTHANSA Completes Purchase Of Significant Air Berlin Assets, Alitalia Next? Lufthansa yesterday closed on a transaction that allowed it to acquire 20 Air Berlin aircraft, Air Berlin’s ‘NIKI’ subsidiary as well as AB’s LG Walter operations. The deal amounted to $210 million Euro (approx. $250mm USD). In return, Lufthansa agreed to protect all jobs that were affected specifically by this deal. In other words, LGW and NIKI employees do not need to fear for their jobs. In his comments, LH Boss Carsten Spohr indicated that Lufthansa would infuse over $1 Billion Euro into the Air Berlin acquisitions which will cover updates and upgrades to the aircraft, as well as future aircraft acquisitions for LH’s LCC Eurowings, which is where all the Air Berlin assets will be assigned to going forward. Several large parts of Air Berlin have yet to be sold. It appears that Easy Jet and Thomas Cook / Condor will also benefit from the liquidation of Air Berlin, though no specific deals have been announced. Ryanair has apparently been blocked out of any chance to benefit from the Air Berlin garage sale. During this recent shopping spree, Spohr also suggested that Lufthansa would very much be interested in Alitalia. Though he firmly denied any interest in acquiring the struggling carrier in it’s current form (which is basically as bad as Air Berlin’s condition), he did suggest that Lufthansa would be very interested in helping the Italian gov’t create a ‘New’ Alitalia. I thinking ‘Lufthalia’?? While Air Berlin navigates bankruptcy through the German legal system, it has announced that cuts to under-performing long haul routes will take place almost immediately. The decision comes as a result of a dramatic fall-off in bookings that has taken place since the bankruptcy announcement. Berlin – Abu Dhabi will be canceled beginning September 17. Berlin – Chicago will be canceled beginning September 30. Berlin – Los Angeles will be canceled October 1. Berlin – San Francisco will be canceled October 1. Dusseldorf – Boston will be canceled October 1. For now flights from Berlin to Miami and New York (JFK) remain unaffected as do flights from Dusseldorf to Boston, Fort Myers, Orlando, New York, and Miami. Also unaffected at this point are flights from Dusseldorf to Cancun, Los Angeles, San Francisco, Punta Cana, Puerto Plata, Varadero, Curacao, and Havana. I suspect these aforementioned routes won’t stay on the timetable for long but at this point AB plans to operated them as scheduled. It is widely expected that Lufthansa will come away with a significant stake in Air Berlin after negotiations are completed between the German government, Air Berlin, and Lufthansa. It also appears that Easyjet will stand to benefit from certain Air Berlin assets as well. At this point it appears that Ryanair is the odd man out and will not be a benefactor of AB’s bankruptcy.